While it may not have been "a billion years in the making" like the original Star Wars trailer describes, 5-25-77 took over a decade to finally make it's debut. The movie, directed by Patrick Read Johnson, premiered at the Genesee Theater in Waukegan, Illinois. 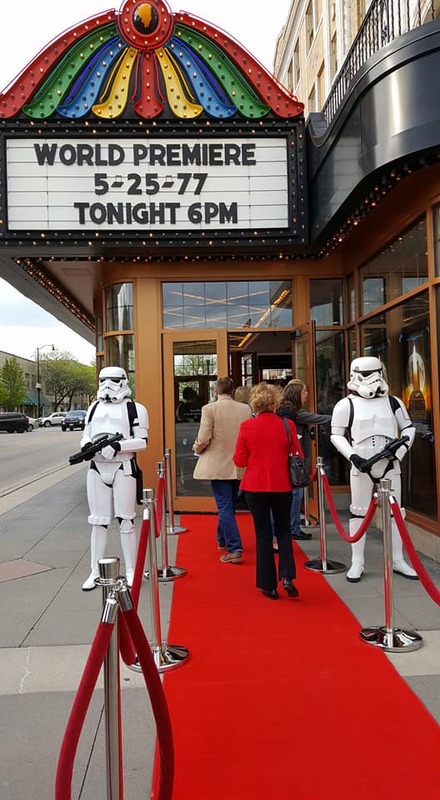 As eager patrons flocked towards the doors, they were met by a series of costumed characters dressed like Darth Vader, Boba Fett and a handful of Stormtroopers. A woman holding 5-25-77 buttons made sure to greet every fan and give them a button as a souvenir. Just inside the doors was the t-shirt booth. 5-25-77 shirts sold for $20 each and were black featuring the familiar yellow text. Before the movie encompassed the screen, Patrick Read Johnson took the stage to say a few words and to give his thanks for everyone who made it possible for the film to have gotten to where it was today. Audience members cheered as members of the cast and crew were recognized and honored for their work. 5-25-77 tells the story of Patrick Read Johnson's life as a young filmmaker. He was an outcast with very few friends, no father figure and a dream that most people considered to be impossible. This young man's dream was to make it as a director in Hollywood. The motion picture featured the boy working with a few friends and family members to create movies in the hopes that eventually a big time director would see them and like them. Star Wars was this boy's most anticipated movie of all-time. He tried to pay for forty of his friends to see it. Star Wars was the movie that changed the way people see movies, it changed the way movies are made, and it has become a cultural phenomenon. Patrick Read Johnson grew up in Wadworth, Illinois and he first saw Star Wars at the Genesee Theater. It was the perfect place for Mr. Johnson to debut his movie. The movie will be across 32 theaters on May 25, 2017...40 years after it all began.